"Oh my God. Jamie Allan was truly amazing. Absolutely loved his show. Exceeded all my expectations and I can't recall how many times my jaw hit the floor." The show ended with quite possibly the best live illusion I have ever seen… it left me absolutely awestruck wondering how on earth Jamie had done it. The most impressive live performance I have ever seen…It would have been worth the ticket price just to see the end! Isaac Newton wrote, “If I have seen further, it is by standing on the shoulders of giants”. The same modest message is conveyed by Jamie Allan in his magic show, which is framed almost as a presentation about the Evolution of Magic. Building on all that is noble and life-enhancing from the past couple of centuries of magical tradition, Jamie is creating up-to-the-minute magic, based on the sound principles established by Robert-Houdin, Devant, Houdini and the other giants of yesteryear. In keeping with David Devant’s motto All Done By Kindness, Jamie treats all his volunteers gently and with respect. Moreover, he explicitly states that his purpose is not to fool us as such but to recreate for us that sense of wonder we used to experience as children. Far from throwing down a gauntlet – or even showing off – Jamie offers his magic to the audience as a gift. Although the show is slick in the sense that it’s well thought-out and smoothly and elegantly executed, there is a slightly unpolished quality to Jamie himself which beautifully reinforces the impression that, instead of sitting in a huge theatre, we are joining him at a private party, such as the ones at which Eisenheim the Illusionist used to entertain (see The Illusionist film). You find the four of diamonds and everyone goes crazy. Then their phone rings and it’s someone from the other side of the planet and they’re like, “Yeah”. You go to the supermarket and the door opens automatically. You find a deck of cards in your shadow and everyone freaks out. I’m interested in that dynamic. Jamie Allan addresses this by making it clear he’s using technology because – and in the same way as – everyone else does. He’s using it to create 21st-century magic with what have become everyday objects. Not that every effect involves a smartphone, an iPad or social media; there’s plenty of low-tech magic too, with newspapers, rope and even playing cards. The show includes a wide variety of tricks and illusions, from sleight of hand through manipulation to stage classics such as assistant in a zigzag box and sawing a woman in half. I always enjoy watching a person being cut in two and Jamie’s version is as open and transparent as you’ll find. Having seen a great many box illusions in my time, however, I’m rarely excited by them any more, but Jamie’s made me sit up and take notice. Old favourites like the silks and candles routine figure, alongside feats of mentalism and a stunning display in which laser beams apparently defy the laws of physics. In tribute to Houdini, the evening ends with a stirring bit of escapology. The iMagician tour runs until 31st May and perhaps beyond. Jamie is an extremely accomplished magician, who has performed for corporate clients at the highest level: don’t miss the chance to see him for yourself. Whether you’re always on Twitter or don’t know how to send an email, I believe you’ll enjoy this show. Magic is seeing somewhat of resurgence at the moment in theatres with the likes of Dynamo and Darcy Oakes about to embark on huge national sell out tours, so it seems perfect timing that Jamie Allan should be on tour now. Sure there are the recognised ‘standard’ magic tricks like sawing a person in half but what sets this show aside from the rest is that it is packed full with technology and that really gives it the wow factor, as well as some ingenious twists on ‘old favourite’ tricks. The show attempts to describe the evolution of magic and begins from the inspiration of Robert Houdin’s Orange tree. Houdin is renowned as the father of modern magic and since then every magician has tried to emulate his magic right up until today. Allan is no exception to this role and with 21st century technology he more than succeeds. Following a mind boggling close up card trick, the first ‘old favourite’ to be updated is the Zig Zag Lady trick as well as the sawing a lady in half. Both leave you absolutely speechless as you simply cannot see how physics allow what you are looking at to be possible. Throughout the show Allen is assisted by glamorous pair Amy and Nat as well as the less glamorous but equally important Luke! Each take pivotal roles in the magic performed. Before the interval the audience are asked to send various bits of information via social media to Allan during the break, and standing in the bar at the interval there seemed to be more mobile phone activity than a normal Opera House show interval. As the first half draws to a close Allan demonstrates sleight of hand that is breathtaking to say the least. Performing a routine he admitted had taken most of his life to perfect it was clear the practice had made perfect, one only can imagine just how many thousands of hours it took, but every second was worthwhile. The second half of the show highlighted just how 21st century technology has been able to change magic with iPads becoming an integral part of one trick. It also became clear how the previously request information submitted by the audience during the interval was to be used in another ‘old favourite’ brought right up to date. Allan states one of his main inspirations was founder and CEO of Apple, Steve Jobs. In a salute to jobs Allan performed another mind boggling card trick which was closely filmed and displayed on two huge video screens either side of the stage, and perfectly choreographed to music. As the evening drew towards its conclusion a little manipulation of laser beams was added to further heighten the wonderment on stage with our host seemingly picking up laser beams and twirling them like batons above his head. We were told magic is not about fooling people, it is about creating a moment of wonder. This could not have been more apt as the final illusion using a glass tank filled with nearly a ton of water highlighted. Never have I seen an illusion like this played out live so brilliantly done. Magic has never been so magical. Jamie Allan’s iMagician show starts as it means to go on, as he literally appears out of thin air. Jamie begins by explaining that the show is about the evolution of magic and how famous illusionists and magicians have influenced him. The show is engaging and entertaining from the start and it keeps the audience on the edge of their seats right until the very end. It includes a mixture of card tricks, old magic with a twist and some fantastic modern work using iPads. But, much to my horror, I ended up being a part of it. In a huge twist of events I was randomly selected to go on the stage and be part of a trick. It was an illusion which got the whole audience involved. It encapsulated a combination of the modern world of social media and the nostalgia of a time capsule. And it left me absolutely awestruck wondering how on earth Jamie had done it. The show ended with quite possibly the best live illusion I have ever seen, which was in honour of the late great Harry Houdini. The show has a perfect blend of new and old magic and offers something for everyone. For the youngsters, the iPad magic, digital art and lasers are completely spellbinding. And for older people, the history of magic tricks and the modern twist on old illusions is refreshing and captivating. It was a fantastic evening and whether you believe in magic or not it isn’t one to be missed. I went into the theatre a sceptic and came out a convert! My husband was not keen to go -apparently he doesn’t find magic or illusions remotely entertaining. But I needed a lift, so along he came. We parked at the NCP car park very close to The Alhambra, and walked the 3 or so minutes to the theatre. The studio is a small theatre within The Alhambra, and was really well signposted from the main theatre. The venue certain had a small and intimate feel – there were no allocated seats, so because we were there early, managed to sit very close to the front. Although even at the back, no one was far from the action. The premise of the show was the evolution of magic, and it really told the story of how magic had evolved and how famous illusionists and magicians had influenced modern magic. Jamie was entertaining and engaging from the moment he set foot on stage. He started out demonstrating old fashioned magic – I don’t want to go into too much detail and spoil it for anyone who wants to go, but from the very start, the audience were rapt. He had live cameras and big screens set up so the audience could see what he was doing, and he was quite simply an absolute master of his craft. Throughout the show, he invited audience members to participate and check what he was doing. The small and intimate nature of the venue really helped to draw the crowd into the performance and feel a part of it all. The show was a mixture of old magic, old magic with a twist and some fantastic work using smartphones, iPads and social media that got the whole audience involved. The show culminated with quite possibly the most impressive live performance I have ever seen – as homage to the great Houdini. It would have been worth the ticket price just to see that! Most impressively, my husband, who was not remotely interested in going, was drawn in and amazed from the very beginning. He thoroughly enjoyed the performance – as much as I did. The audience ranged from the very young (I’d guess 7+), all the way up to people in their 80s. And everyone was as amazed and impressed as each other. We had a totally fantastic evening, entertaining from the very start and the whole evening flew by. I would absolutely love to see Jamie Allan again, and would love to take my daughter along next time. Fantastic – if you get chance, you have to see him. The Evolution of Magic explores the work of history’s greatest illusionists and magicians demonstrating how modern technology can make them even better. Magician Jamie Allen brought his new show to Harrogate, the first stop on his new UK tour forming an interesting blend of illusion, card tricks, sleight of hand and modern technology including iPad, Twitter, Facebook and lasers. Allen has one mission, to make magic more accessible and to help adult audiences regain their sense of childlike wonder. It achieves this in spades and it is no mean feat making what could be cheesy old fashioned magic tricks modern with masses of audience participation. Although it was hampered by a few first night technical problems and a bizarrely placed laser show that served no magical purpose, the show is thoroughly enjoyable, and head scratchingly “how did he do that?” like any good magic show should be. The first half of the show focuses on the history of magic and revisits some of the greatest tricks, from great magicians such as French magician Robert Houdin and the world famous Harry Houdini. Utilising film clips on big screens, Allen manages to make the tricks relevant and accessible to his audience who may be unaware of magic’s rich and varied history. The performance shows that magic can still be relevant and awe-inspiring even in this modern, and much more cynical age. Going into detail would spoil the surprise of the magic, but needless to say it is thoroughly entertaining, emotive, thought-provoking and great fun. There were some truly astounding card tricks, one especially memorable one using the Sting song ‘Shape of my Heart’ as its cue and soundtrack. Allen clearly has honed his craft, showing off top notch stage craft. There was also a lovely tribute to Apple founder Steve Jobs, using a simple wooden puzzle set against an inspiring recording of Jobs’ voice. There were some much bigger more astounding illusions that no doubt thrilled the inner child in all of the audience. The show really does end on a high, as it recreates a dangerous escapist illusion that Houdini himself never completed. Allen has a great stage presence making jokes and talking easily with the audience, educating and astounding them in equal measure. His passion for magic is clear and infectious to the audience. Magic Elixir which was performed as a very emotionally presented tribute to Steve Jobs the founder of Apple (complete with Steve’s recorded voice in the background). Some may say “It was just a puzzle” (albeit a very magical one!) but Jamie’s presentation was both magical and uplifting, and much of the iMagician Show could not have been possible, if it were not for the visionary that was Steve Jobs, and this performance was a wonderful way of Jamie showing his respect and appreciation in a very public way. I found it very emotive, and moving ..... I also loved the Digital Art performed with the I Pads as seen on The One Show - The Laser Routine, and even his Cardtoon routine performed on the big screen, I never thought that a marketed effect, available in many Magic Shops, would play so big for an audience of several hundred people, but it did, and that was down to ONE MAN called Jamie Allan “I Magician” (to me the I stands for INCREDIBLE by the way!!). To sum up the show: Original! – Entertaining! – Great Magic! Jamie Allan’s I Magician is a “Must See”. There was a gasp. The audience was hooked. He had only gone and done it. Having asked a completely random member of the Playhouse crowd to shout out the first card that came to mind, Jamie Allan preceded to flick the deck, flipbook style. It was a deck which had a little magician drawn on the back of each card; each animation in a slightly different position. As Allan flicked the pack, the little character began to move. And guess what. The sequence culminated with the penned magician pulling out the exact card that was called out moments before. It was impressive stuff. And it epitomised Allan’s show, iMagician. The tricks were clever, imaginative, convincing and extraordinary. One, using a combination of Facebook, Twitter and text messaging, was quite simply astounding. This, too, was typical of what iMagician was all about. 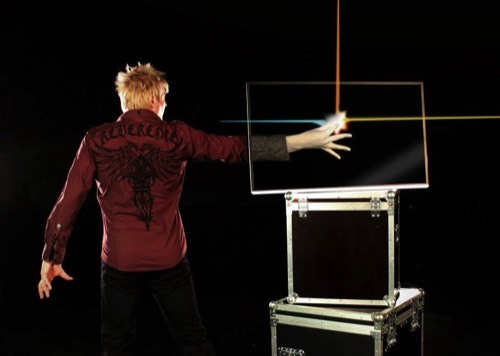 Allan blended technology – including iPads and a voice-recognition device known as Siri – with incredible magic and illusion, all enhanced through cutting-edge projection and world-class sleight of hand. It was Harry Houdini meets the 21st century. The show also looked at the evolution of magic, with Allan giving a brief history lesson of famous magicians through the ages and their impact on the industry. It offered a fascinating alternative to the tricks and stitched the show together. Allan’s Playhouse appearance was the second date of his iMagician show, which is his debut national tour, having performed around the world for 10 years. He admitted that everyone involved was still experimenting with the show, to make it as polished and complete as possible, but he certainly set the bar high with last week’s performance. Magician are the tough critics. See what some of the biggest names in UK magic are saying about iMagician! “Congratulations to Jamie Allan tonight in Manchester. Great to see an audience lap up some great magic, performed so well.